Come rain or shine, our cafe is open Monday to Friday, 10:00am – 2:30pm. Our cafe is staffed mainly by our amazing dedicated volunteers, who give their time to prepare and serve hot and cold food and beverages throughout the day .. and customers are always welcomed with a smile. Our roast on Friday is highly recommended, and you’ll always find freshly baked cakes on the counter to purchase! Our Community Cafe has been running since the Centre was opened in 2001. 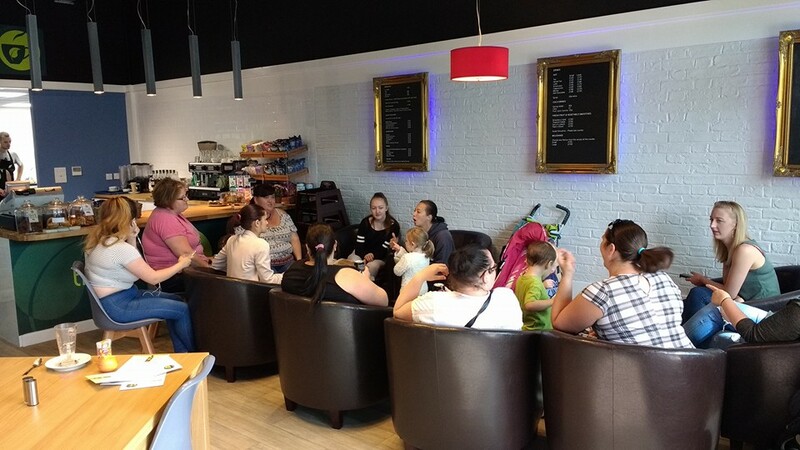 When we moved premised in 2016 we created the cafe as a bright and cheery venue to ensure it was welcoming and a safe and secure environment that customers of all ages could easily access. You can also spend the time to find out what other services are available at Fusion, and what events are coming up .. locally and across Maidstone. Our continued aim is to provide a sense of community, and is a great place for people of all ages to get together, meet up with friends and make new ones. The success of our cafe depends on our brilliant team of volunteers! If you are interested in joining the team you can contact us via our VOLUNTEER PAGE or just pop in for a chat with a member of staff. Freshly Made Cooked breakfast, Jacket potatoes, sandwiches, paninis, scrumptious cakes, snacks, hot & cold drinks and more. Available to eat in or take away. Roast on Friday Don't miss out on our roast on Friday! Sittings are 12noon and can be booked beforehand by calling 01622 691177. Event Catering Whether you are having a meeting, party or event at the Centre, or you are looking for outside catering, we are here to provide for your needs. Send us a message, or pop in and see us, and we can discuss your requirements further. Cafe Facilities Disabled-friendly, child-friendly with small soft play area and public toilets. We also have free wifi and desktop computers are available to use free of charge. We have many more exciting plans for our cafe .. so watch this space!